If you have been living with a less than perfect smile due to overcrowding, overlapping, rotated, or gapped teeth, you have probably considered orthodontics. However, the thought of the appearance and restrictions of metal braes causes some hesitation. Now, you can benefit from a less noticeable and shorter treatment with Invisalign. This treatment has quickly become the preferred choice for teens and adults due to an array of benefits that are not possible with metal braces. As a Lehigh Valley dentist, we offer the alternative treatment to give you the straight, healthy smile you have been wanting. Traditional metal braces use brackets and wires to pull the teeth into their correct alignment. This form of treatment is traditionally used because it is affordable and effective for treating minor and complex alignment and bite issues. However, since wires and brackets are used, the treatment is noticeable, lengthy, and comes with certain restrictions. As a result, more than 2.5 million people have now turned to Invisalign as an alternative to metal braces. Invisalign uses removable, clear aligners to gradually move the teeth. The FDA-approved treatment uses impressions of your teeth to create a treatment plan through a series of aligners. The aligners are then worn for about 22 hours per day. Less Noticeable Treatment: Since the aligners are custom-made from a clear plastic, they are virtually invisible for added confidence during treatment. Shorter Treatment: On average, treatment with the aligners only takes about 12 months. Increased Comfort: The aligners are smooth and custom-made. As a result, there is no irritation to the inside of the lips or cheeks. 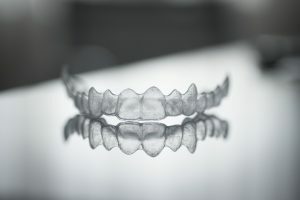 No Dietary Restrictions: Since the aligners are removable, there are no dietary restrictions; however, you cannot eat or drink anything except water while wearing them. Convenience: You will not need adjustments so you will require fewer office visits. You will only need to come into our office every few weeks to monitor the progression of treatment. Easy Oral Hygiene: You do not have to brush or floss around brackets and wires, making oral hygiene easy. Simply, care for your teeth by brushing twice a day and flossing daily, while taking time to properly clean your aligners. Versatility: Invisalign is effective for treating several alignment and bite problems. However, you will require a thorough consultation to ensure you are a candidate for treatment. If you are ready to benefit from the clear choice for a straight smile, you need to contact your Allentown dentist to schedule a consultation. We will evaluate your oral health and the alignment of your teeth and bite to create a treatment plan. We will then take impressions of the teeth to send to the dental lab to make your custom-made aligners. In about two weeks, you will be on the path to a straight, confident smile with Invisalign.